Made of premium ABS plastic, durable and corrosion-resistant. Ideal for trapping and capturing rat, mice and other large rodents.Once the door closes, the mouse can\'t get out until you open it up. 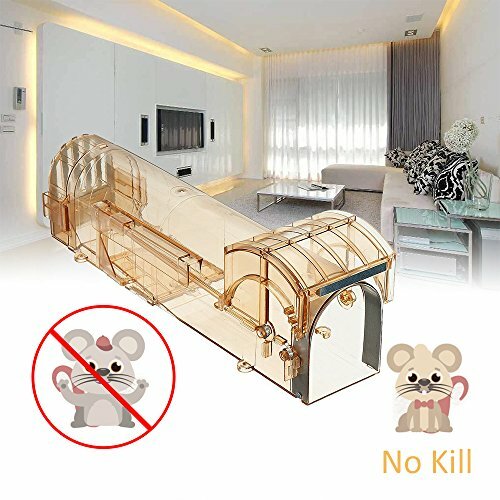 Safety to Children and Pet: The catch mouse trap is no harm to children and pet. It is very safety tool. No poison, no glue, no touching mice or any dropping so no risk of disease. Safe around children and pets. Especially suitable for using at home. Efficient and easy to use: Design & Durable-Ideal for trapping squirrels, skunks, mink, and similar-sized animals. Simply place the peanut butter or others in the compartment and open the spring door. When mice are caught alive and unharmed, all you have to do is take the trap out to a wooded area and release the mouse. It\'s very fully reusable and can be used over and over. saving your money. Just remember to clean it thoroughly with hot water before resetting it. Works as it should and good quality.